The Book of Psalms is perhaps the most cherished book in the Old Testament. In this lively volume, two experienced teachers invite students to read and explore the Psalter and roam widely among its poems. The book introduces the dynamics of the biblical text, helping students become careful and attentive readers. It covers how to read Hebrew poetry, the Psalter's basic genres, the idea of "the psalmist," the metaphorical world of the Psalms, and the theology of the Psalms. Sidebars, discussion questions, and plenty of examples enhance the reading experience. This clear and concise guide is accessible to all serious students of the Bible. 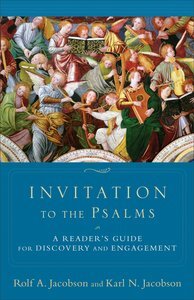 About "Invitation to the Psalms: A Guide For Transformative Reading"
0 Available. Expected to ship July 2019.